Ickwell v Oakley. Picture: David Kay. They lost 1-0 to Flitwick Town, Ritchie Bevan netting the all important goal in the Premier Division supported by Sportsform. Second place is now held by Ickwell & Old Warden who notched up their sixth home win on the bounce with a 4-2 victory over AFC Oakley M&DH. Neville Allen, Scott Alleyne, Ashley Drummond and Marko Tobdzic all marked the home scoresheet against M&DH replies via Alex Liburd and Elijah Hukin. Down at the other end of the table basement club Renhold United suffered lose number 15 on the bounce when defeated 3-0 at Sharnbrook who, for the first time in five outings, were returning to winning ways. Joe Mcdonagh with a brace and a single strike from Lewis Donald did the damage. Queens Park Crescents made it three wins on the bounce with a 3-2 victory at AFC Kempston Town & Bedford College. Ayaz Hussain, Chisom Amadi and Domnic Parrella were on their scoresheet against Town replies via Taylor Bakogeorge and Daniel Green. Wootton Blue Cross will now face a home tie against Sharnbrook in round two after coming from 2-0 down with 15 minutes left to beat Crawley Green Reserves. Ryan Smith with a brace plus Lui Sarrington netted the goals following earlier Green strikes from Nash Bennett and Mark Smith. Whilst it will also be a home round two tie for Stevington against AFC Kempston Town & Bedford College after they won 4-2 at Wilstead. Lee Reynolds and Matt Davidson were on the home scoresheet. There is no change at the head of the Division One supported by O’Neills standings following wins for the top two clubs. For leaders Totternoe Reserves it was a 7-1 victory at Henlow, Lee Fromant leading the way with four goals, Tom Howson netting twice and Tom Mills once against a lone home reply via Paul Wright. Second place Riseley Sports took their unbeaten sequence to 13 games with a 3-1 home win over AFC Kempston Town & Bedford College Reserves. James Cooke, Duncan Campbell and Jack Healy were on the Sports scoresheet against a lone Town reply via Michael Sexton. Now unbeaten in their last seven starts and up to fifth are Lea Sports PSG who ran out 4-2 home winners over Flitwick Town Reserves who had twice led the contest. Glen Collins, Ali Mohiyaldeen, Alex Bailey and Sean Dixon netted for PSG against Town replies via Josh Arthur-Kent and Kevin Higby. Down at the other end The 61 FC Luton Reserves ended a 10 game losing run and lifted themselves off of the bottom with a 3-2 home win over Shefford Town & Campton Reserves. Matt Conway with a brace plus Kane Dempsey netted the goals to do the damage against Town replies via Malcolm Marimirofa and Adam Larsen. The bottom spot now being occupied by Meltis Albion who were beaten 3-2 at Biggleswade FC Reserves. 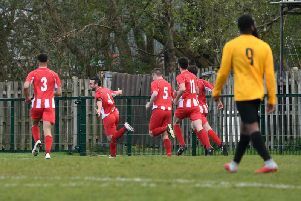 John Veal, Liam Beech and Edd Lamb were on the home scoresheet against Albion replies via Akeen Lender and Nathan Bryne. Cranfield United Reserves and Cople & Bedford SA shared the spoils from a 2-2 draw, Jordan Conway and Ben Martin on the United scoresheet against a brace in reply from Lucas Banton. The Sandy v Wixams game was postponed due to the state of the Bedford Road pitch. With the top two clubs away on County Cup duty third place Wilstead Reserves took full advantage to close the gap at the head of the standings by notching up win number five on the bounce in winning 2-1 at Renhold United Reserves. Luke Pursey netted both goals against a lone United reply from Michael France. Houghton Athletic are now back into fourth following their 2-1 victory at AFC Oakley M&DH Reserves. Benn Hayward and Gavin Watson netting the goals against a lone home reply via Callum Mullins. The biggest win of the day went to CS Rovers who returned to winning ways for the first time in five outings with a 9-2 home win over Westoning who were losing for the first time in seven starts. Daniel Bhatti led the way with a hat-trick to go alongside single strikes from Ben Rodgers, Ultan Coonan, Ruari Griffin, Joe Lydon, Tom Taylor and Shane Robb against Westoning replies via Lewis Wilson and Aaron Turner. Now unbeaten in their last seven starts are Marston Shelton Rovers Reserves who won 4-3 at Elstow Abbey. Gary Russon, Carl Borromeo, Jim Burraway and Harry Baker netted for the Rovers against Abbey replies via James Reynolds twice and Billy Mills once. Bedford Albion safely made their way into this season’s final by winning 5-2 at Sundon Park Rovers. Michael Peters, Adam Lewis, Paul Babbington, Ali Bucknall and Ryan Kelly netted to bring up the nap hand against Rovers replies via Ethan Tenn and Scott Fraser. They will now face Henlow Reserves who required a 4-3 penalty shoot-out win at Atletico Europa after 90 minutes play had seen the sides deadlocked at 0-0. Chris Powell, James Campbell, Manjit Singh and Piers Le Grand were the successful penalty takers for Henlow. League leaders Kempston Athletic retained their unbeaten away record after they shared the spoils from a 3-3 draw at third place Harlington. Josh St Clair Pierre netted twice and Craig Damon once against home replies via Farrell Whitman with a brace and a single strike from Dan McMillan. Second place Clifton maintained their unbeaten home record with a 1-0 victory over now bottom of the table White Eagles. George McMillan netting the goal. Now up into fourth are Caldecote A who are now unbeaten in their last eight starts after netting a 1-0 home win over Black Swan. A second half penalty from Neil Giles earned them the points. Whilst sixth place Lidlington United Sports were the 3-1 winners at Flitwick Town A. Jhey Tompkins, Ben Stubley and Edward Janes all found the back of the net against a lone Town reply from Luke Snapes. However the biggest winners of the day were Wootton Village who recorded their third home win on the bounce in beating AFC Kempston Town & Bedford College A 6-1. Hamayun Shahid with a brace was joined on the Village scoresheet by a penalty from Dan Smith plus strikes from Philip Creek, Jamie Rogers and Ross Milton. Nikola Stanchev netting the lone Town reply. For Stevington Reserves it was a return to winning ways with a 5-2 victory at Dinamo Flitwick which duly lifted them off the bottom of the league. Liam Donovan led the way with a hat-trick and was joined on the scoresheet by single strikes from Toby Haggerwood and Liam Dixon against home replies via Daniel Day and Deano Myers. Elsewhere there was a 2-1 home victory for Shefford Town & Campton A over Sandy Reserves. Josh Lummis and Jack Hills netting the goals against a lone Sandy reply via Matt Johnson.